There might now be one less reason to kick the office vending machine — consumers will soon be able to pay for their snacks with a smartphone, as well as send real-time complaints about their Snickers stuck in a spiral. Cantaloupe Systems, a Bay Area-based start-up that provides tech services for vending machine operators, has been working to deploy near field communication-enabled payment terminals at vending machines in San Francisco, Chicago and the mid-Atlantic region. But not for hungry Apple iPhone users, since the NFC technology that is being installed only works with Google’s one-tap payments app for Android-based smartphones, called Google Wallet. 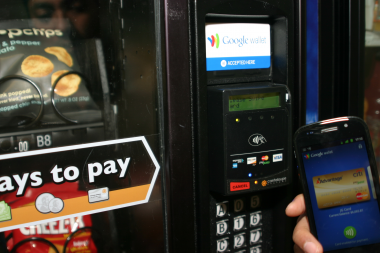 Cantaloupe co-founder Anant Agrawal said that Google Wallet-equipped vending machines will feature prominent stickers so consumers know which machines work with the app, and that eventually operators and even Google could send coupons and rewards to users as they purchase snacks. For vending operators in the U.S. — there have long been such technologies in places like Japan — one-tap mobile phone payment could be a much-needed boost. From 2008 to 2010, vending machine sales fell 18 percent to $19.25 billion, according to an industry report from Automatic Merchandiser. This is attributed mainly to a high U.S. unemployment rate — fewer people working means fewer people in offices, and office purchases account for 80 percent of all vending machine spending. Consumers are apparently not buying snacks at theme parks and airports, either. Still, using a smartphone to pay at vending machines is a long way from becoming office protocol. Google Wallet is currently only available on one smartphone, the Sprint Nexus S 4G phone. And while Cantaloupe said it has installed 6,000 NFC bezels so far, that’s a small percentage of the 80,000 machines in Cantaloupe’s network, and an even smaller fraction of the six million vending machines across the country. In addition, while industry reports show vending operators are investing in new technology, many still don’t even accept credit card payments, because the benefits of easier payments don’t outweigh the transaction fees on low-margin items such as snacks. Nonetheless, some think the ability to offer more coupons and rewards in the future is worth the investment in the tech now. Mark Stein — whose company, Mark Vend, operates 2,000 vending machines in businesses, hospitals and universities in the Chicago area — plans to install NFC-enabled bezels on half of his machines by early 2012. High-tech vending machines might have another benefit, too. With the introduction of compatible mobile apps, consumers could potentially request that certain items be included in the next round of snacks, and send immediate complaints when a machine is malfunctioning. In other words, no more snacks stuck in vending machine purgatory.